We decided to catch an early flight from Coron to Moalboal at 6am (1.5hours). Once arriving at Cebu Airport its around a 3 hour drive south to Moalboal. We took a Grab cab (grab cabs are equivalent to Uber and are pretty cheap - they are available in most big cities in the Philippines). It cost around 2500 Peso (£35). For the first 3 nights of our stay our accommodation was at Herbs Guesthouse and I have to say it was my favourite stay of the trip so far (I have been in the Philippines for the past 10 days) The staff are super friendly, they have amazing breakfast which is included in the price. The Guesthouse is well known for making all their own food using home grown herbs and food they have in their gardens. The Coconut Jam and home made Herb Butter is the best thing I have ever tasted. They also have Mango Jam and home made Honey which are also super delicious! 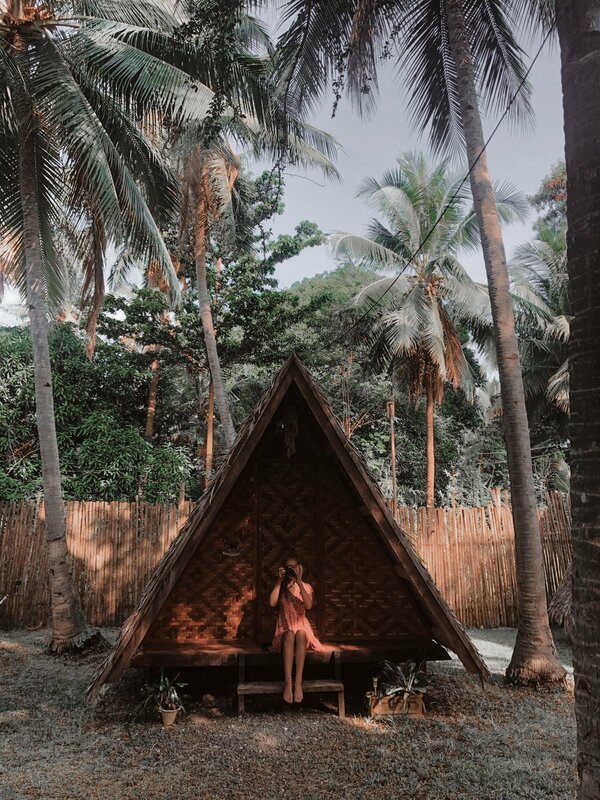 You stay in huts fully made of bamboo which come equipped with mosquito nets and a ceiling fan! In the middle of the accommodation are lots of hammocks for the guests to chill in and spend the afternoon reading a book. It’s a really nice chilled place to stay that’s a little further out of the hustle and bustle of the town but an easy 10 minute moped ride or 30 minute walk. The staff there were amazing, Cat (in the above image) was so lovely - super friendly, happy and told us all the best places to visit! The accommodation is full of amazing little touches, from lights to use when it’s dark to if you get any laundry done - it comes back in little baskets all folded and clean! We walked into town and spent the afternoon exploring the town - there’s lots of restaurants, spas and local shops! 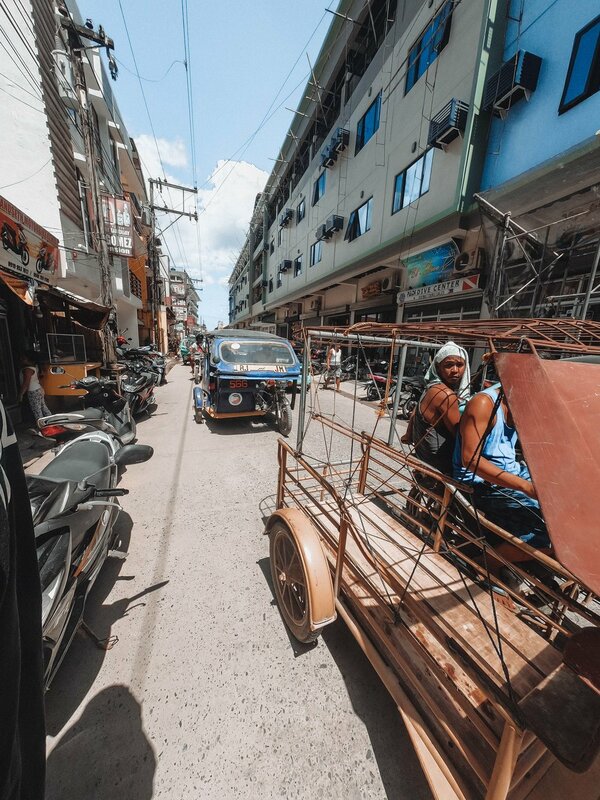 We grabbed a Tuk Tuk back to our accommodation for 200 Peso (£2.90). This morning we decided to head down to the beach by the accommodation and snorkel. I wasn’t expecting too much but this reef was the best place I have ever snorkelled. I was not expecting the coral to be so amazing. There were loads of star fish and if you swim to the edge of the reef - we saw three Turtles! Walking 30/35 minutes up the beach (only possible at low tide), we went to swim with the Sardine run. WOW what an experience. It was incredible - you are literally swimming with MILLIONS of sardines. You can find them just outside the front of Chilli Bar, in the town by the beach). 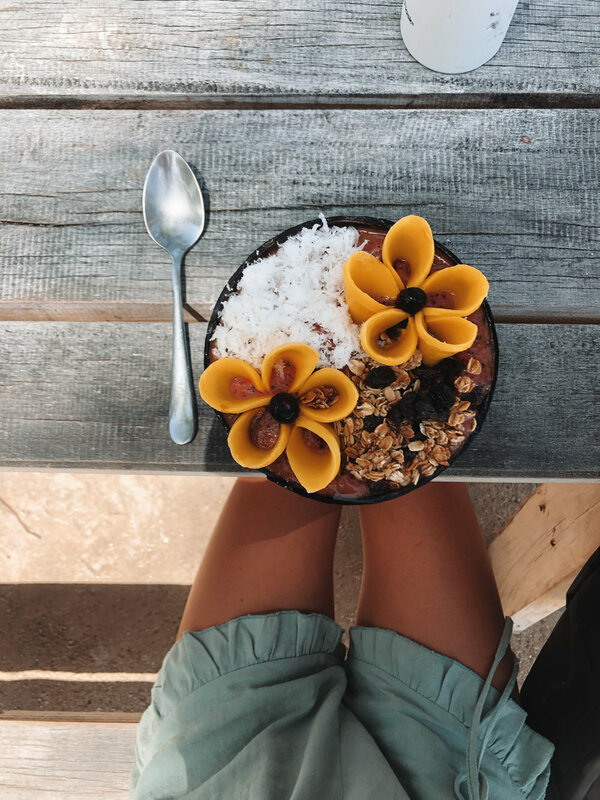 After a super exciting morning, I spent the afternoon working on my laptop at The French Coffee Shop (this cafe is great for Wifi and coffee) if you head further up the road there’s a cafe called Shaka Cafe - INCREDIBLE smoothie and granola bowls. For dinner we headed to Venz Kitchen - really great for vegetarian and vegan but also do a lot of meat dishes. I had the vegetarian Eggplant Sisag - 2 dishes and 3 drinks came to 700 peso (£10). We woke up super early this morning to head to Kawasan Falls before all the tourists and people on the canyoneering tours arrived. Ideally you want to get there around 7.30/8am. From our accommodation it was a 45 minute motorbike ride along the coastal road. It’s not easy to know where you’re going as there’s not a lot of signs around (the locals prefer you to do a tour than just head there so I guess it’s deliberate). After asking 3 different locals for directions we were finally told to park in the Church carpark (50 peso). From there you can walk 20 minutes to Kawasan Falls. Oh my, I have never seen anything quite like it. The images I had seen of the Falls were exactly like how it looked. Turquoise waters with a stunning view of the waterfall. Whilst we were taking photos a local came up to us and said he would take us to the 5 biggest jumping spots including the slide for 1000 peso (£15 - £7.50 each!!). It was just the two of us and the tour guide which actually made it really special as we could go at our own pace or go again on several different jumps. At the end, the guide said for us to take however long we liked and give the lifejackets back to him at the end. If you were keen on doing to canyoning, I recommend heading straight to Kawasan Falls and talking to the guys with the life jackets there - they offer a much cheaper rate than any of the tours in the towns, hotels and near to the Falls and it’s a totally private tour, so it means you’re not hanging around waiting for people to jump off the same rocks, you can go at your own pace. I had done canyoning before so this by far was the best way to do it. It skipped out all the small jumps and just went straight to the bigger ones. The jumps were amazing - one 8 meter, one 10 meter and one 15 meter! 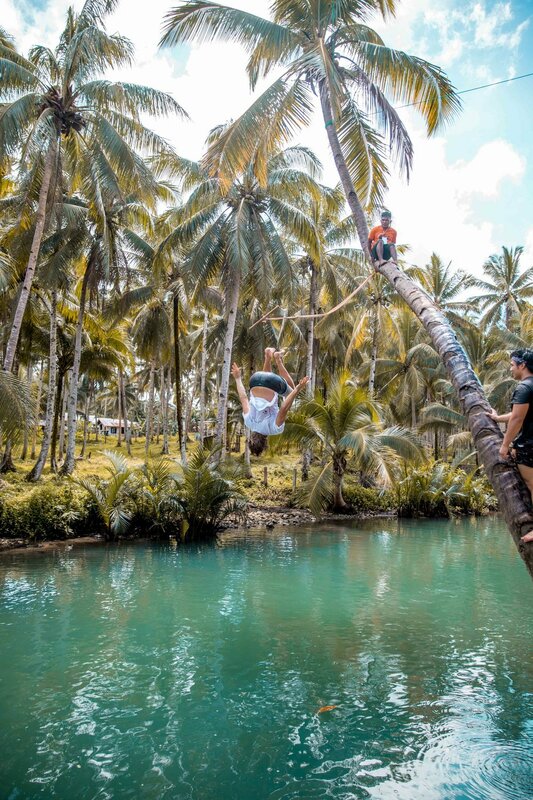 It also included a rope swing which was one of my favourite! Just before the last 15 meter jump there was a slide straight into one of the pools - so much fun! After using up all our energy jumping off rocks, we drove back to our accommodation where we showered and then headed into the town for a browse around the shops. We had lunch at Shaka and Dinner at Venz Kitchen (again - but it’s hard to head somewhere else when the food is so delicious!) I had the Ginataang Talong which is Eggplant cooked with vegetables and coconut sauce. Today was our last day in Moalboal. We tried to stay at Herbs Guest House for another night but unfortunately it was fully booked! We found these little huts a bit further inland that looked really cute and was amazing value for money at just £20 a night for two people! The huts were visually very nice but weren’t as comfortable as they looked! I guess with this place we got what we paid for. I wouldn’t stay here again but it’s a lovely place to visit! After checking into this accommodation we hired a moped from the reception and headed to Whites Beach. It was the weekend so the actual beach was quite busy with locals. I’d definitely recommend visiting here for a swim and relax on the beautiful long stretch of white sand. After an afternoon relaxing we headed for a drink by the pier and for dinner at Silver Ray - we had grilled fish and lots of veggies, super tasty! 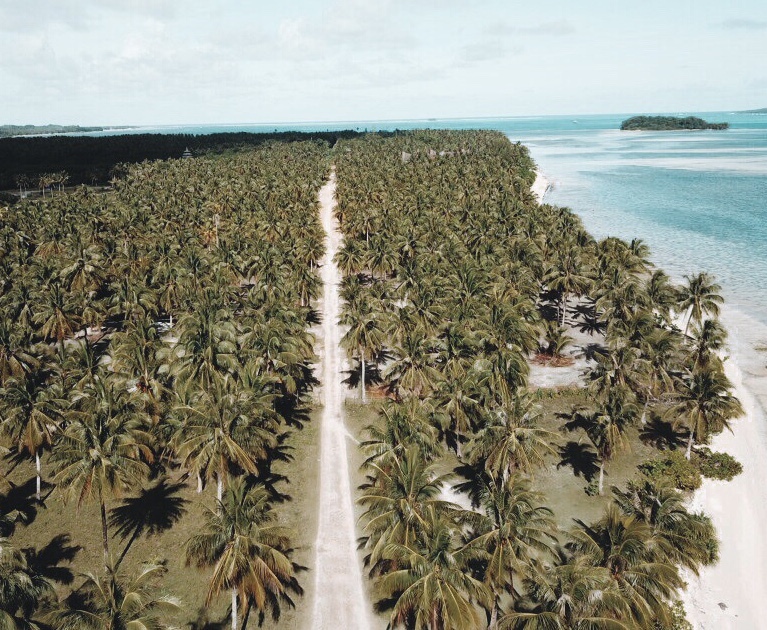 We organised an airport shuttle for the following morning where we were heading for Cebu to then catch a flight to Siargao Island! 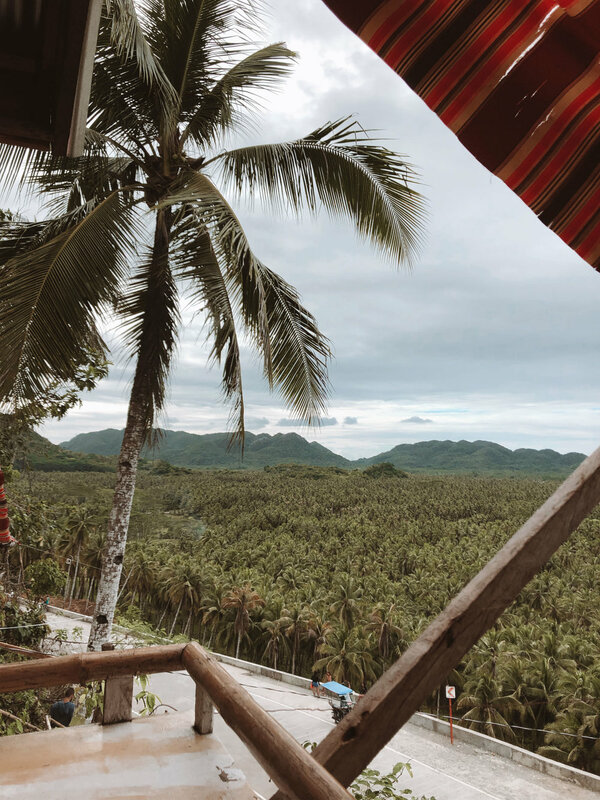 I had spent the first 4 days of my Philippine adventure in El Nido, you can read my El Nido Itinerary here. From catching the ferry from El Nido to Coron, I decided to spend 4 days exploring the Island of Coron. I arrived into Coron about midday and decided to spend the afternoon working so headed for a Coffee shop with good Wifi - SUMMER Cafe & Bar is great for both! The first night I spent at an Airbnb (listed below). It was 1000 peso (£14.50) per night this included a bedroom and private bathroom. This place also had breakfast and a swimming pool and was right in the centre so was perfect location for exploring the island. TIP: If you book using my code: https://www.airbnb.co.uk/c/lydiac803?currency=GBP you can get money off your booking! In the evening, we headed out for some dinner and found a Korean restaurant called Dali Dali - it was super cheap and the food was great! Definitely would recommend if you are Vegetarian. The Hot Springs are definitely worth checking out, we went in the day so they were super empty - the locals said they get really busy towards the evening as most of the time it’s too hot to enjoy in the midday heat. The pools temperature ranges from 39-41 degrees. We then drove 10 minutes further down the road to Cabo Beach - more of a locals beach, usually really good for snorkelling but it was quite cloudy when we went. By evening time the town is really busy with people eating out, so if you are able to book a restaurant, I’d definitely recommend doing so. We made a reservation at Winnies and the food was delicious. The guy that owns it is usually sitting outside the front with his friends - a character to say the least! We booked onto the Ultimate Boat Trip which explores 7 destinations in one day. Sounds a lot, right? It was but TOTALLY worth it. The price was 1200 Peso (£18) non negotiable. The first destination was Kayangan Lake. If you’ve seen photographs from Coron and even the Philippines it was probably from this Lake. It is absolutely beautiful and well worth a visit. 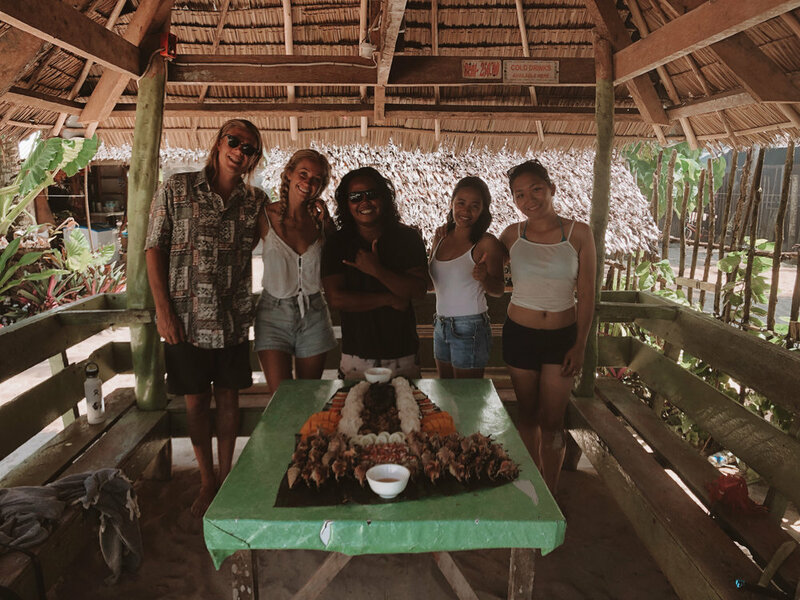 The next stop was lunch at a super secluded Island, Atwayan Beach - the lunch was really tasty and the views were amazing. They cooked the food on the back of the boat on a BBQ and it definitely caters for all dietary requirements. Next up was Skeleton Wreck - a Japanese ship wreck from WW2. Diving down to this wreck was seriously amazing, you can also book onto Scuba Diving this wreck on another trip but we didn’t have time to! 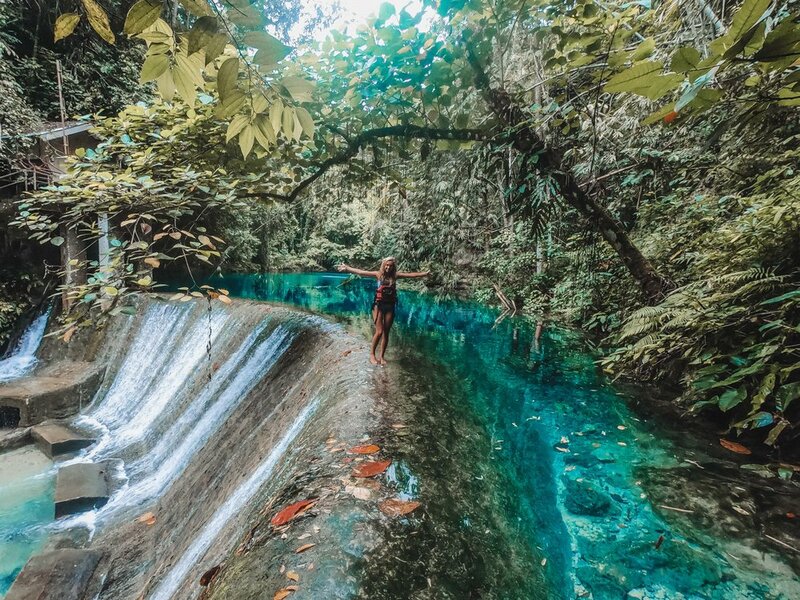 I was completely shocked with how beautiful The Philippines was, i’d seen a load of photographs online that looked like the water had been enhanced but it is so turquoise blue and crystal clear, it was a sight I really couldn’t get my head around. When it came to the next stop - The Reef - you can only imagine what swimming and diving with the fish and coral was like. The sixth stop was CYC beach - a beautiful little island that you can Kayak around or lay on the beach and soak up the late afternoon sunshine. The final and my favourite stop was Twin Lagoon, the boat ride into this magical part of the Philippines was amazing. It then moors up in the first lagoon and you are told you can swim under the rock or climb over via wooden stairs to the opening of the second lagoon. It is truly magical. Don’t forget to grab a snorkel and dive down to swim with the hundreds of fish in the water. After a big boat day we decided to head to Tattian Altrove - an Italian restaurant that we had been to in El Nido (you can check out that blog post here). The food is seriously tasty and possibly the nicest Italian food i’ve tasted. Every night there is a queue outside so make sure you get there early or make a reservation. I spent the morning getting some work and emails done before heading for lunch at Fika - really recommend coming here for breakfast or lunch - lots on the menu and you can sit on the balcony that overlooks the town below. After refuelling we decided to rent a moped for the afternoon to drive north of Coron and explore another part of the Island. We drove for about an hour with no real plan or destination and discovered Conception Falls. Upon arrival there is someone in a little shop where a donation box is to enter the falls. It’s a short walk down (10 minutes) through what feels like a few families back yard and farm. You then climb down a few steps with a bamboo handrail to the falls - we were lucky enough that there weren’t any other people there! 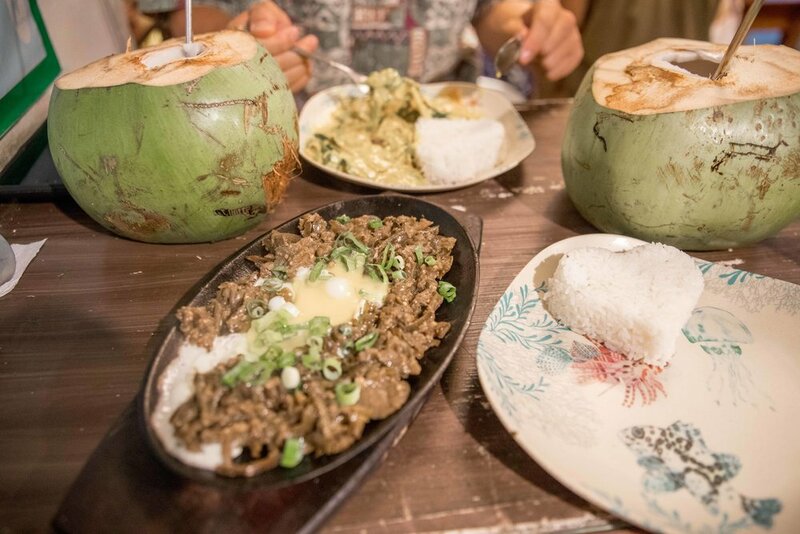 About a 1 hour drive back to the town of Coron, we decided to head to Bhajti - a vegetarian restaurant that I had read up on and heard lots of good things about. It definitely didn’t disappoint and I would really recommend checking this place out if you can. You can’t make reservations so maybe head for an early dinner at 5.30pm. Coron is a beautiful part of the Philippines that is well worth a visit! I will definitely be back. 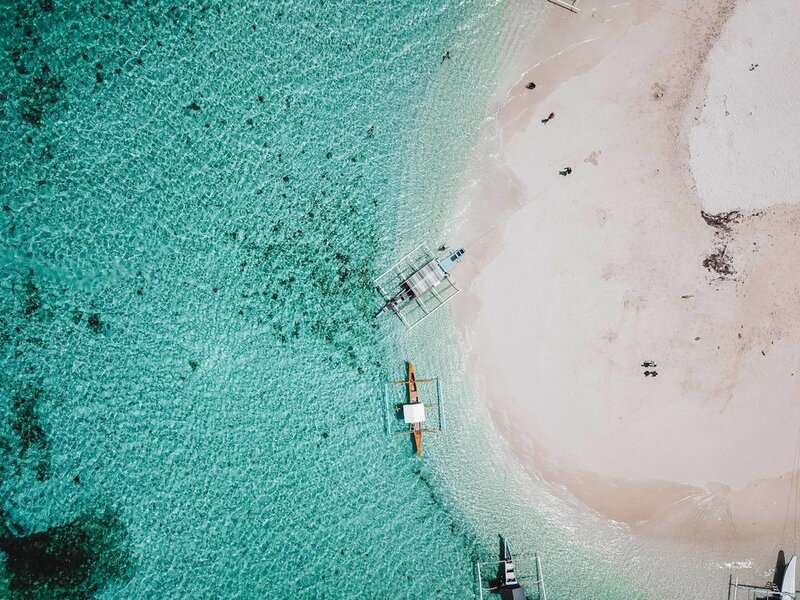 Stay tuned for my next blog post: Travelling the Philippines: Moalboal Itinerary. I have never been to a place quite so beautiful. 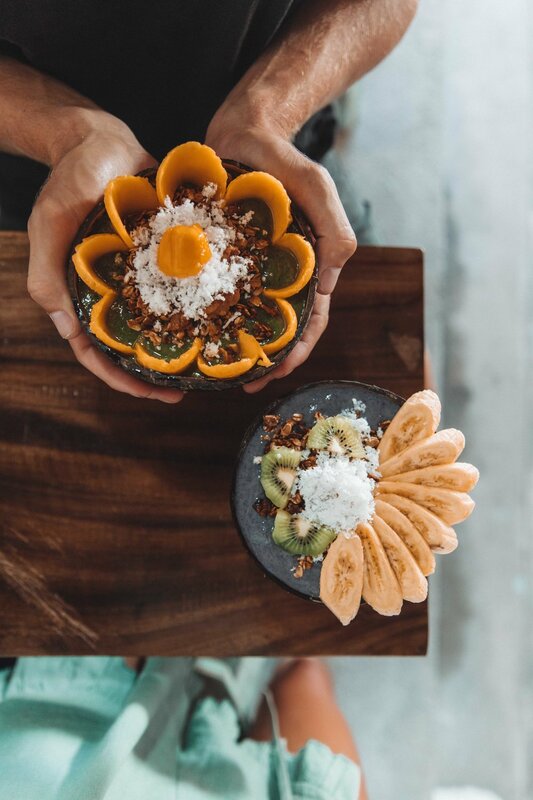 If you have never been lucky enough to visit the Philippines, I hope this blog post persuades you because WOW, it is something else. 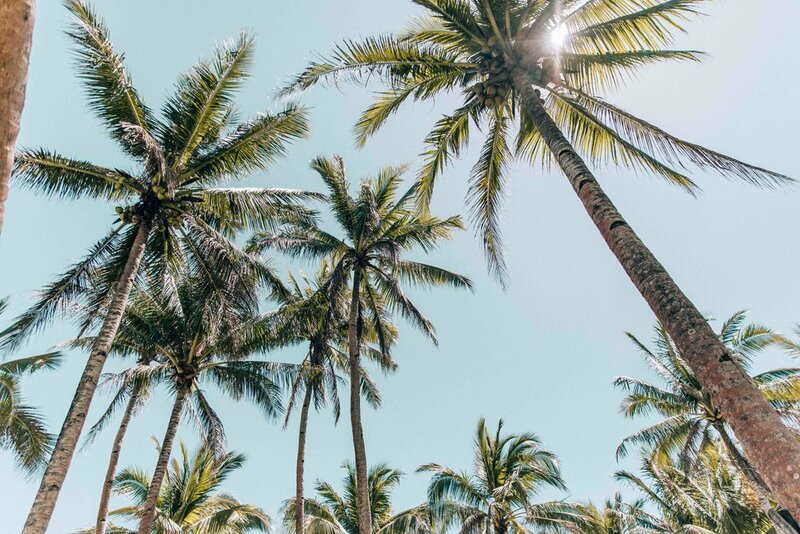 I was travelling in Australia when I booked the Philippines, it was a great stop over place on the way back to the UK and somewhere that I had heard a lot about and was definitely on the travel list of places that I wanted to visit. Flying from Sydney to Manila was the cheapest and easiest route to take for me. I decided to stay in Manila for the night so that I could catch a morning flight to Puerto Princessa which is the largest airport on the island of Palawan in the morning. TIP in Manila: Grab app is the same as Uber and is super cheap. You can access the app in any large Cities in the Philippines. Cash payment or you can top up on the app. TIP: There are flights from Manila to El Nido but usually have to book them quite far in advance because they get fully booked. We headed to our accommodation which was El Gordo’s Adventures and Guesthouse - we initially booked 2 nights but ended up staying 3 as it was in such a beautiful location. If possible, book the room at the front of the house as you get your own balcony with an amazing view of El Nido. 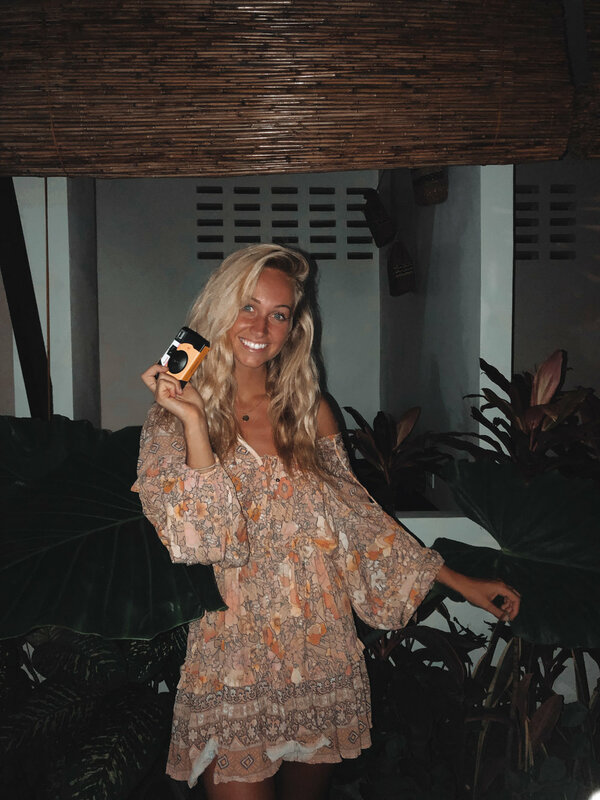 We headed for evening drinks at Sava Beach Club and ate at Tuk Tuk Thai Restaurant - both situated on the beachfront and a perfect way to spend the evening after a day of travelling. Today we decided to explore a little around El Nido and the beaches further north from the town. We hired a moped for 500 peso (£7.30) and drove to Nacpan Beach (40 minutes drive). Initially we wanted to explore a lot today but were super tired we ended up spending the whole day at the beach until sunset! 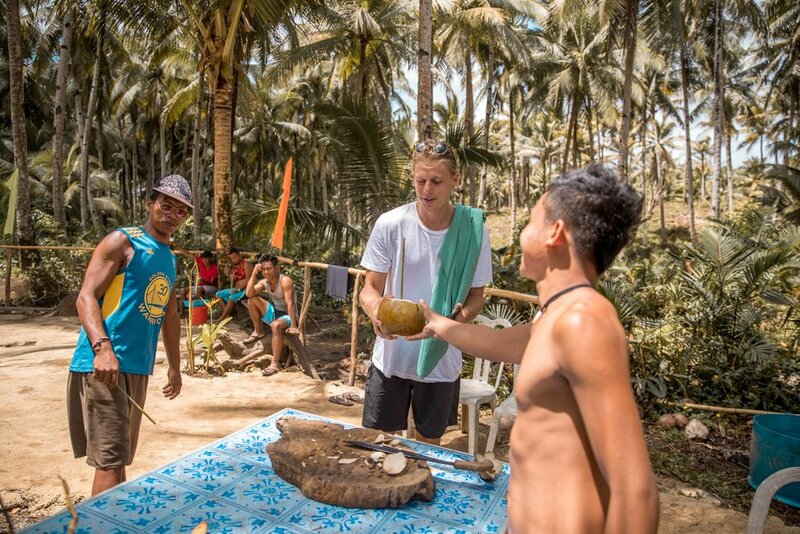 We had a coconut for 100 peso (£1.45) and a massage for 300 peso (£4.35). Nacpan beach was really beautiful and I definitely recommend visiting! There’s also beach huts you can stay in right on the beach for 1230 Peso which is equivalent to £18!! 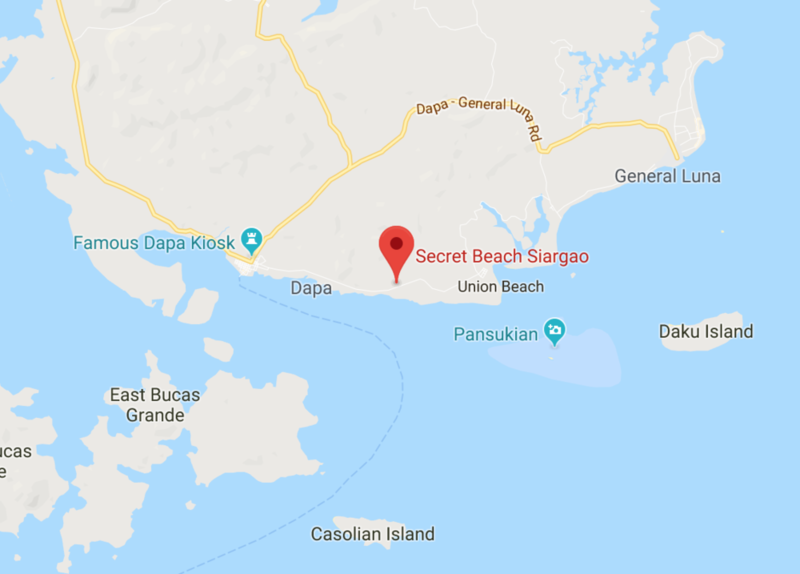 TIP: Other places to visit in this area are: Lio beach for sunset, Nagkalit-kalit Waterfalls, Bucana Village, Duli Beach and Las Cabanas for sunset. A boat trip in El Nido is a must. It is pretty much the only way to see some of the beautiful and untouched surrounding islands of Palawan. We did Tour C which included Helicopter Island, Secret Beach, Star beach, Matinloc Shrine and Hidden beach. I’ve heard amazing reviews about Tour A and B too. The trip was 1200 peso each (£17.67) for full day with lunch included. You jump on board a lovely Filipino boat with around 20 other people - so not too crowded which I loved. Helicopter Island is, you guessed it, shaped like a helicopter and was our first stop on the trip. It was BEAUTIFUL. 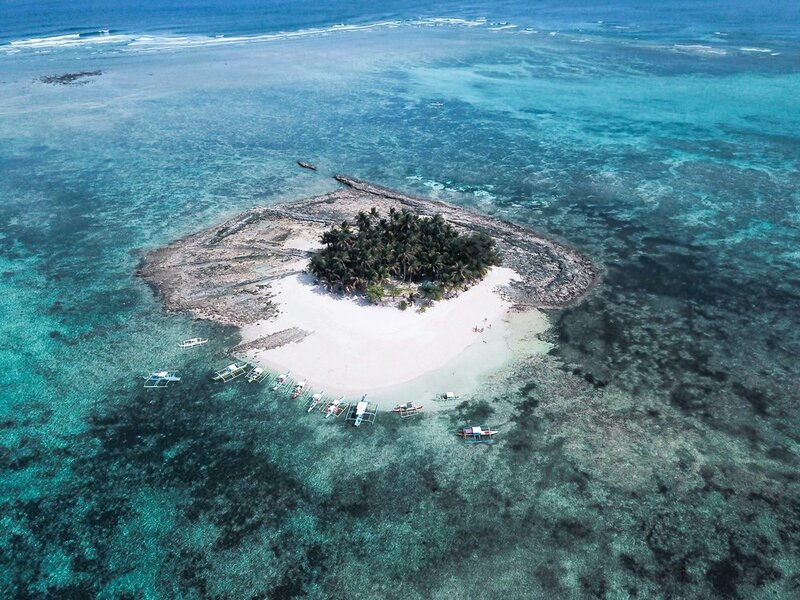 I have to say, the Philippines is probably one of the most beautiful places that i’ve seen and the fact that the islands are super untouched and have hardly any tourists has a big part to play in this. We stopped here for about 40 minutes before heading off to Secret Beach. Secret Beach was amazing. You moor up just by the rocks at the entrance of a small opening. You swim through the opening (make sure you snorkel it as there’s lots of fish! ), you are then welcomed with an amazing lagoon of water and a secret beach! Star Beach is where we stopped for lunch. Another beautiful beach where you can swim around the rocks and see lots of fish! Matinloc Shrine was our fourth stop of the day - an optional small fee visit to see the shrine and a short walk up to a viewpoint. Hidden Beach was our last stop of the day and my favourite. The boats moor up, you jump off a swim around the rocks and are faced with a huge opening between two rocks. You walk through the shallow waters, which are completely crystal clear, and end up at a beautiful private beach. 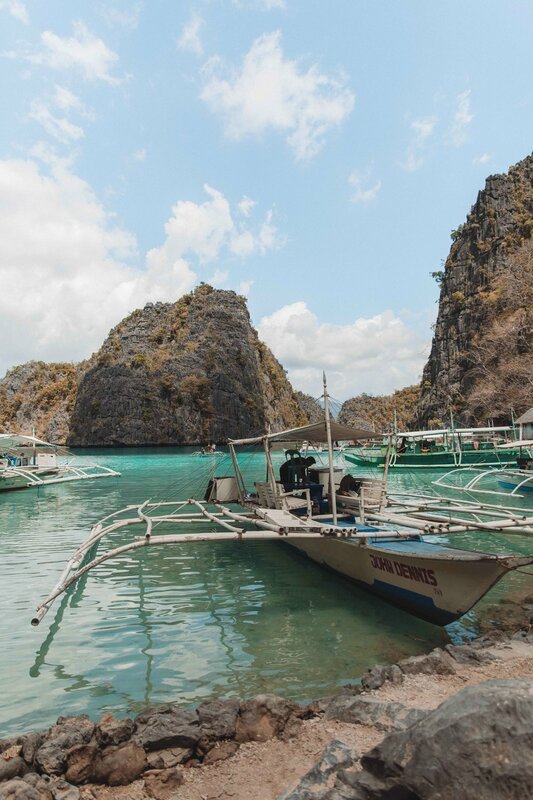 If I had more time in El Nido I would have definitely done another trip - possible Tour A as I would have loved to see the Big and Small Lagoons. For dinner we headed to a well raved about restaurant Trattoria Altrove - a must visit here but make sure you either pre-book or turn up early as it gets very busy! The ferry service is the most efficient way to travel between two of Palawan’s most visited tourist destinations, El Nido and Coron. Pre-purchase a ferry ticket from any of the local tour shops for the El Nido - Coron Ferry (1800 peso - £25). 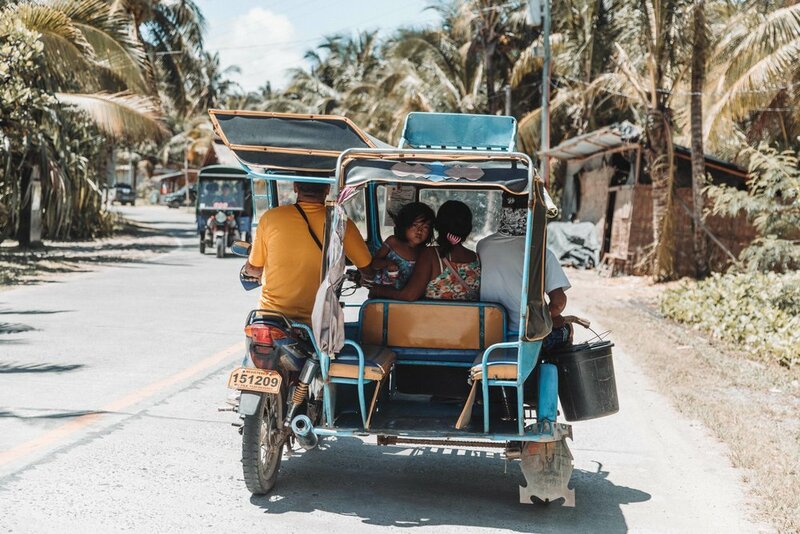 It takes around 3.5 hours and is an air conditioned boat - there are other means of getting to Coron but I found this to be the most efficient and easiest as the ferry port is right on the beach front of El Nido. 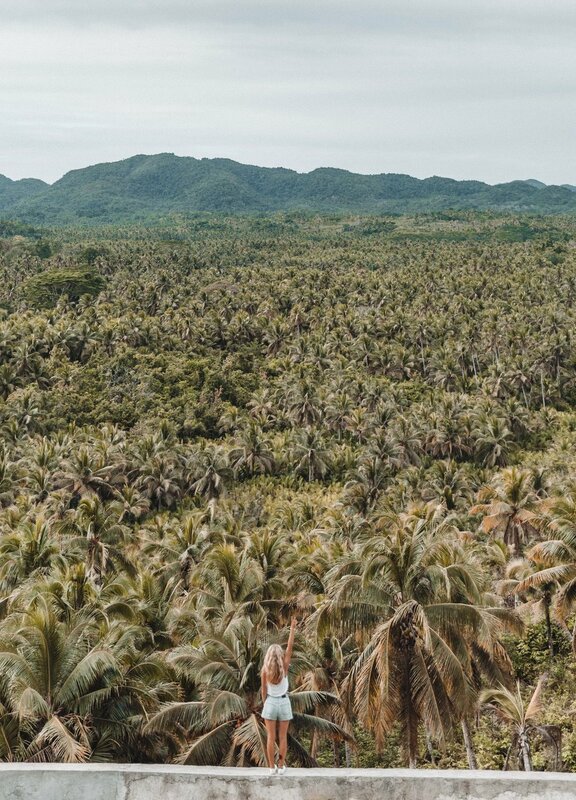 El Nido is definitely a town you could spend 5 or so days and feel like there’s still more to explore. The best way of getting around is via moped/motorbike. I will be posting my Coron and MoalBoal Itinerary shortly so stay tuned!